Has there been some unidentified hindrance in your Christian life? Do you often ask the question ‘why me?’ when things go wrong on a personal level, or ‘why not me?’ when you feel God’s blessings are eluding you? If we are honest, we often feel let down, or even somewhat of a fraud, because of the absence of blessing and victory in our lives. There appear to be some barriers to blessing, obstacles in the way which prevent us maturing as Christians. Christian conversion is not the end of our spiritual search and transformation, but rather the beginning; following which, Jesus Christ begins the process of changing us. We embark on a journey, one which will never end until we are like Him. For our transformation to begin, we need to diagnose the obstacles to blessing in our lives, so that we may receive the appropriate remedy. Sins, wounds, and demons are the three general areas where most, if not all, problems occur. Obviously, the solutions to each of these problems are different. Sins should be repented of, wounds need to be healed, and demons must be expelled. 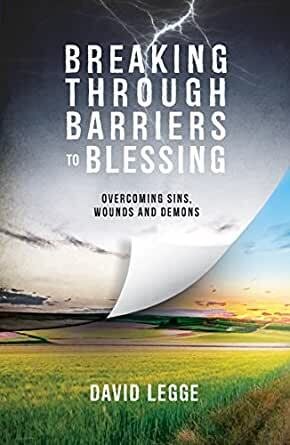 In Breaking Through Barriers to Blessing, David Legge seeks to help you identify and overcome the hindrances to your progress as a Christian, releasing you to a life of blessing and fulfilment. "This book practically and effectively applies the transformational power of the Gospel to some of life's most intractable problems. I recommend it to those longing to break through barriers into God's blessing!" 5.0 out of 5 starsA book everyone needs! I have to confess I’ve not read the entire book but I’ve completed the devotional developed from this book on my Bible app and it is fantastic. David has a gift for communicating powerful truths that need to be heard. I’ve been involved in a Christian healing prayer ministry for almost 20 years and what he shares in this book is practical and powerful for anyone seeking wholeness and healing, this side of heaven! I’ll be reading the entire book as soon as it arrives and I’ll be recommending it to those I have the privilege to pray for, I’m sure! So glad I found this! I would recommend this book based on the end of chapter prayers alone - so helpful for reflecting and working through each chapter! The three main sections of the book (repentance, wounds and demons) are biblical and practical! Ive found this a hugely helpful book!